Though I originally bought this for a drywall job, it really is the handiest thing since handles. It's perfect for plywood or any other large stock. You will be surprised how often you reach for this. 2. Clamps, Clamps and More Clamps. If you generally work single handed like I do, you really need a good selection of clamps to serve as extra hands when needed. Here are a few of the common types, you might also want to opt for a corner clamp or pipe clamp too. especially with today's dubious warped lumber. I used mine all the time during deck construction to hold warped boards straight while screwing down the board. Buy the longest one you can find. This is another thing I waited too long to get because of cost. 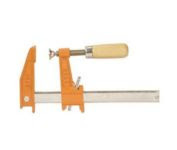 I use these most often to secure stock to the sawhorse or mitre saw, but the are invaluable wherever you need an extra set of hands. 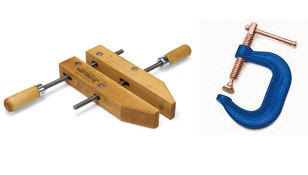 Stronger than quick clamps, these two are what you want when you need something to stay put.